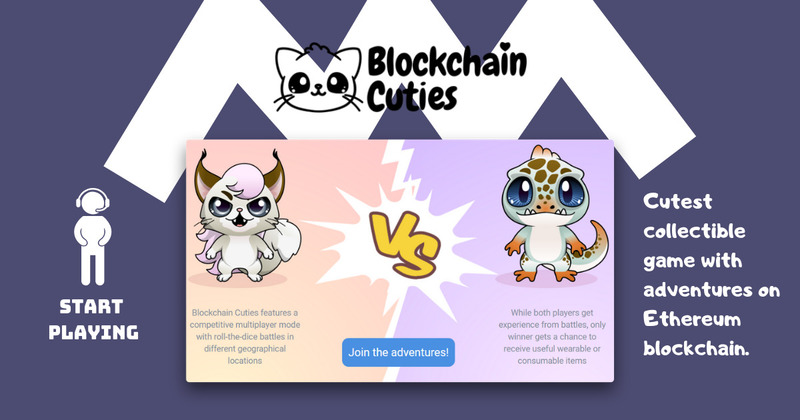 Blockchain Cuties is a collectible crypto game with adventures where you get to play with puppies, lizards, bear cubs, cats and other real and fantasy creatures alike. Each cutie is unique and 100% belongs to you. You get to collect them, breed them, test their skills in battles, arm them and even level them up! In-game economy lets you trade cuties using smart contracts on Ethereum blockchain. Each cutie, which is an ERC-721 token, can be transferred or sold to other players just like a regular cryptocurrency.